Choosing Landing Page will give you a nice dropdown of all your approved Marketo LPs. 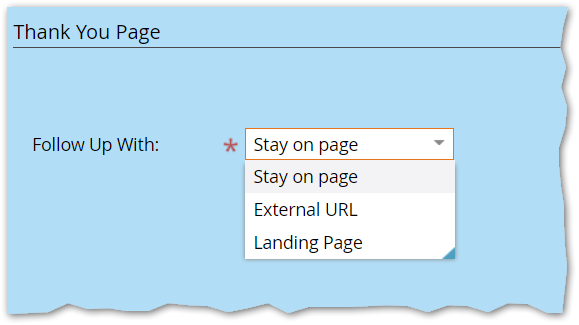 If you choose Landing Page or Stay on Page, Marketo uses a special read-your-write feature to ensure Pre-Fill on the next pageview. If you choose External URL, Marketo looks up the URL in your known LPs but it doesn't look in your Redirect Rules. If the URL is not seen as a core LP URL, even if it does lead to a Marketo LP in reality, then the read-your-write Pre-Fill cache is not enabled. What is “read-your-write” and why should I care? If a user thinks they've made a change to the back end, then show them the new data as if it's been fully saved, regardless of whether system(s) may be still filtering and processing — or even discarding! — the data in the background. It doesn't mean anybody else sees uncommitted data (there are some cases in which it won't be saved, so you don't want to propagate bad info more widely than necessary). It means that for a less confusing user experience, you let a user see their own requested update immediately, instead of forcing them to see older saved data for a few seconds/minutes (even though showing saved data would technically be more accurate end-to-end). Marketo implements read-your-write via the special query parameter aliId. It's a numeric identifier for a set of submitted form values, and it's usable regardless of whether the values are actually saved. When a page has an aliId in the URL, it's capable of (for the most potent example) filling a second form using the data from a first form, even if it was submitted mere milliseconds before. When you choose External URL in Form Editor, Marketo tries to append the aliId intelligently, but it can't know about your redirects (especially 3rd-party redirects) or anything that might disguise the Marketo-ness of the destination URL. As a result, the next LP someone views may show their session's old data (maybe including someone else's email) or no data at all (the session still being effectively anonymous). You don't want that! So choose Landing Page if it's indeed a Marketo LP. When you use the Forms JS API onSuccess method to choose a Thank You URL dynamically (a very powerful option) set the form to Stay on Page in Form Editor, as this will ensure the aliId is appended. Then clip out and append the original query string, which will include the aliId, to the dynamic URL. If you're using a fuller-featured URI parser/builder already, like uri.js, use that instead of the Link/Location method (though the location.search breakdown works perfectly, since it's a key browser function). Just don't write your own parser… I don't want to have to holler at you again! When you use Stay on Page the aliId is attached even if you're using the form embed and the page is a non-Marketo page. It's not fully honored in this case (since Pre-Fill isn't supported with the embed) but it's better to have it there than not.